You may recall a while back I told you about a house that we'd bought to renovate. Well, after over six years of labor, sweat and tears, we passed our final inspection last week! We can now legally inhabit our house. To celebrate, I wanted to share with you a few pics. I've shared pics before, but I'll link to them here, just for completeness. This post has pics of painting the walls. #1 exterior front (beige and gray, with a dark red door). The front porch has a "bridge" over the lowered front yard, creating a sort-of moat. The main floor is wheel-chair accessible. #2 exterior back (I had a hard time getting a good pic of this). 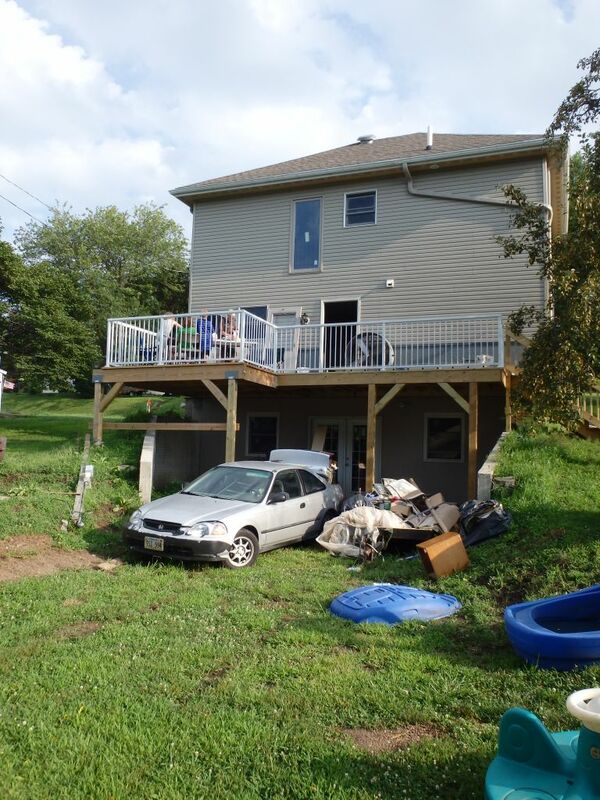 There's a walk-out basement, and a huge deck off the main floor. We'll eventually put a second stove out on this deck so that I can do summer canning outdoors. 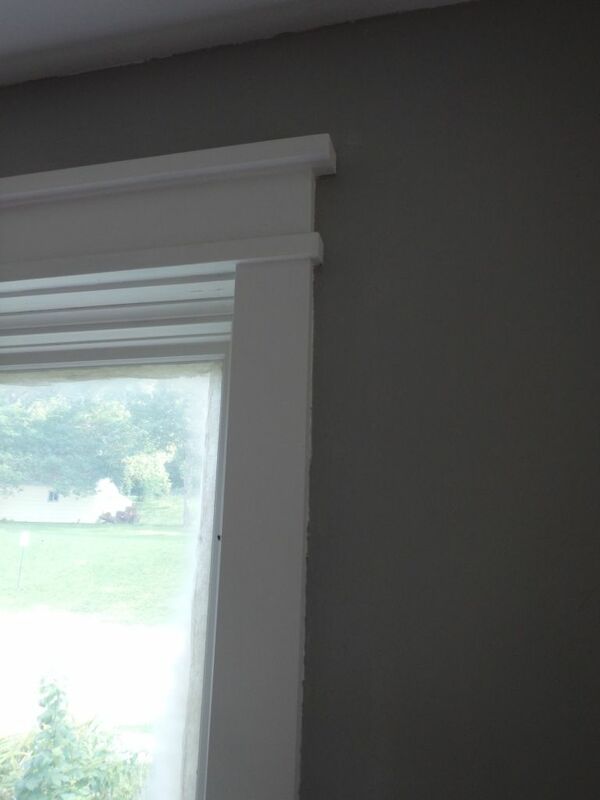 #3 - #4 Gutting the house removed a lot of old character (it was originally built in the 1890s), so my hubby custom-built molding to re-instate some of the character. 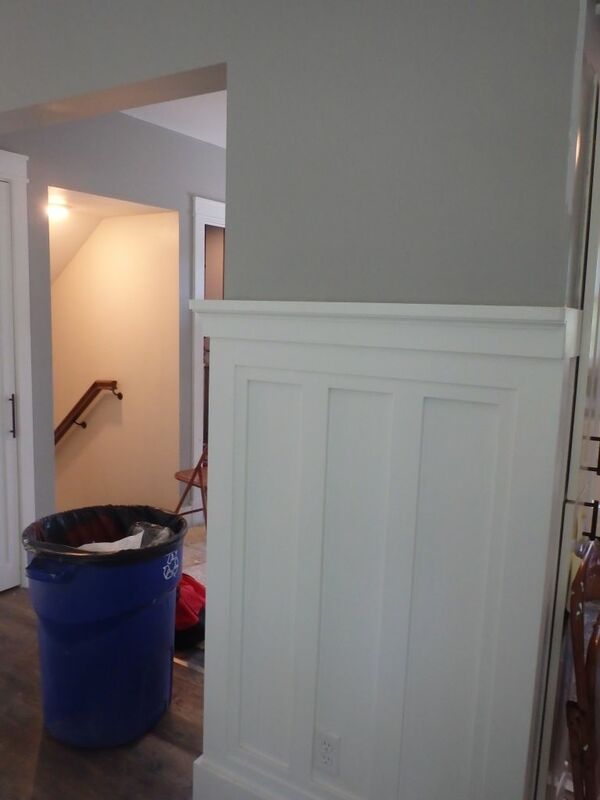 Main floor walls are gray, trim is white. 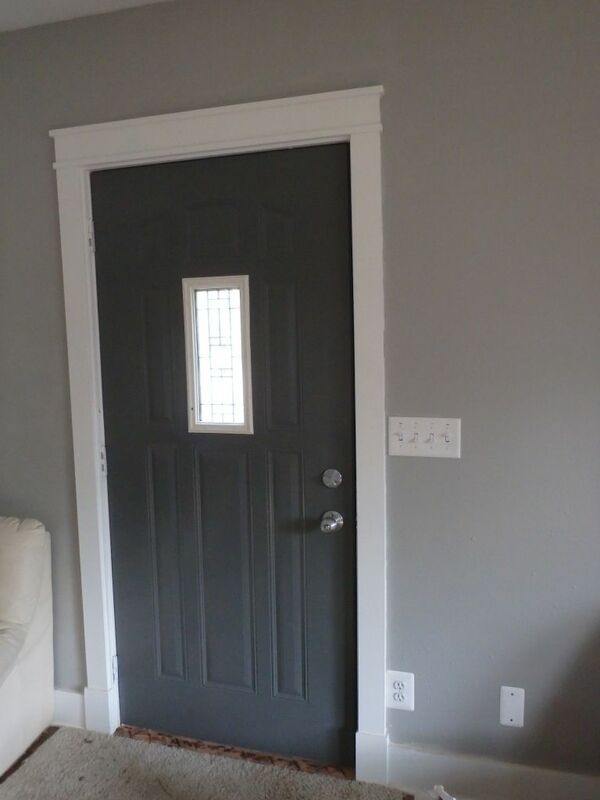 Exterior doors are dark gray. 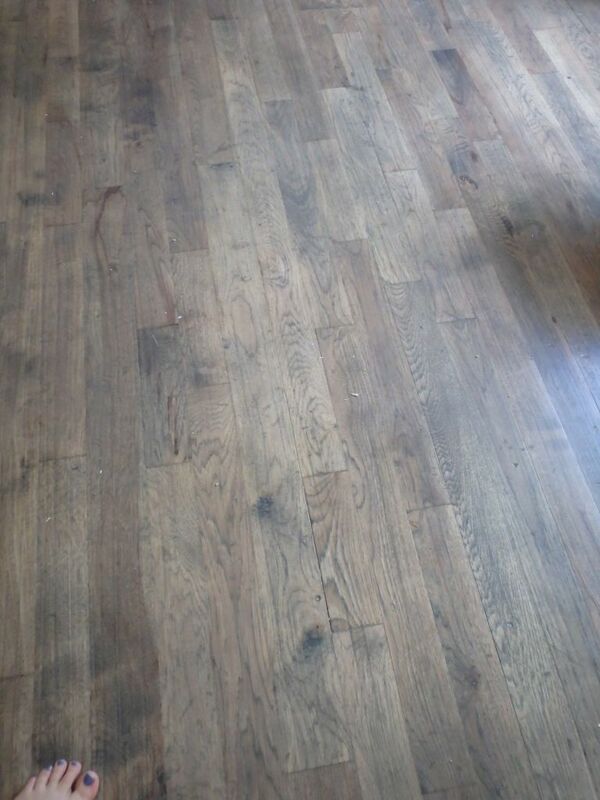 #6 Hickory flooring on the main floor. It's stained a grey-ish mid-tone that is a bit lighter than I thought I wanted, but I ended up loving. #8 Second story (there's 3 bedrooms and a big bathroom up there) has very pale greyed out blue-green walls (that I'm mentally thinking of as "Russian sage", because it's nearly the color of their leaves), with light maple floors and teal doors. #9 The second story bathroom has dark wood, and eventually will have some color other-than-white walls, but right now they're still just primed. It also boasts a jacuzzi. 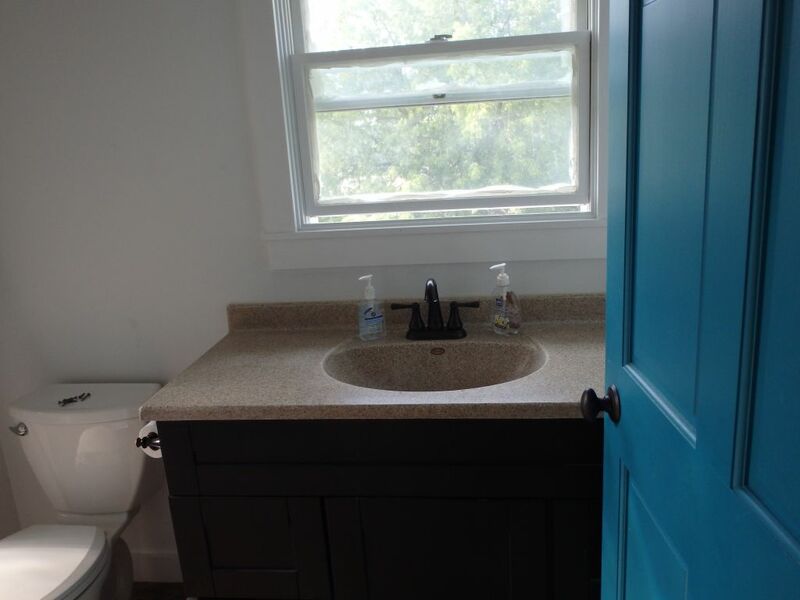 (Main floor bathroom didn't make my pics - it's a very greyed-out lavendar color, with white trim and all white fixtures). #10 The basement stairs have bright carpet to visually signal that we're entering the kid zone. Basement walls are where the bright and fun painting is, and where the kids play area will be. It's officially unfinished territory (we're not adding a ceiling or floor other than the concrete), but I suspect we'll be down there an awful lot. You can see pictures of most of the fun wall murals here. The basic themes that we went for in decorating is muted and calm main floor (it ended up with light and mid-tone neutrals, with dark hardware and dark gray doors. The main colors are cream, white and gray - floors add in a mid-tone brown.) Upper story theme is light and airy - it's mostly blue-green - very light on the walls and teal doors, white trim and light floors. 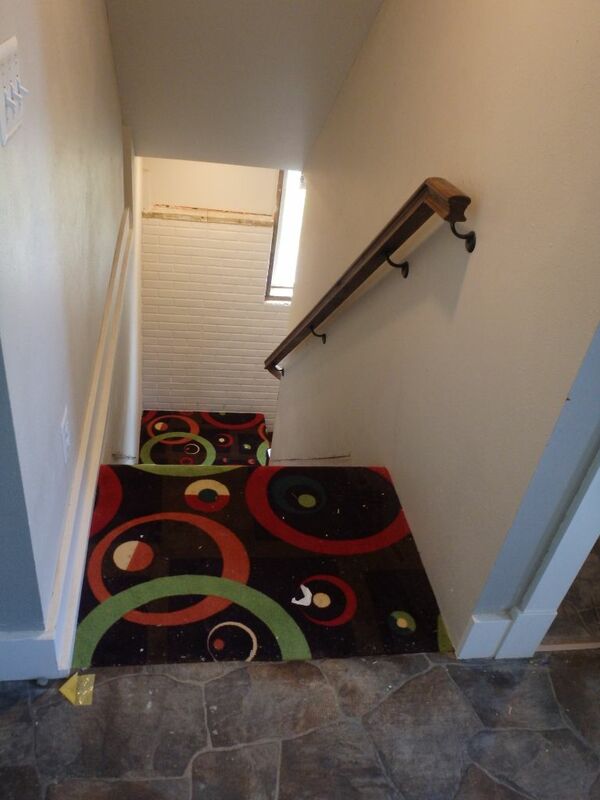 The basement theme is fun and kid-friendly - there's murals on the walls, and wild crazy carpet going down the stairs. Thanks for indulging me with this post - I'm so thrilled with how things are turning out, and excited to move (we'll officially move toward the end of this month - we have to build beds for the kids, do lots of finishing touches and pack up the house we've lived in for the past ten years). Wow, nice job, Amy! I love the wood floors and the custom molding. The colors sound and look gorgeous and soothing. I'm impressed with your thoughtful design as well as your amazing work. Congrulations! Ooohhh.....you and the kids are going to love living here so much! I love the kitchen....and the light airy feel of the house in general. 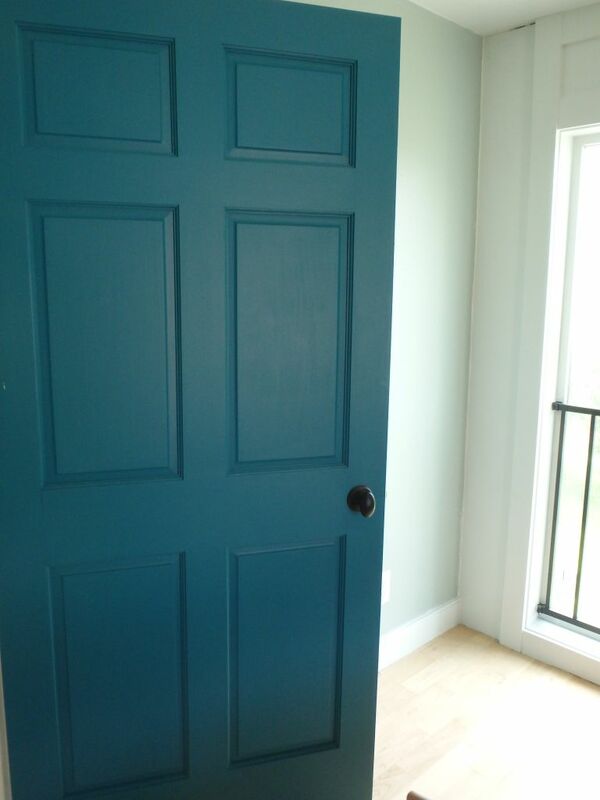 It looks so beautiful and has such lovely teal doors and warm cozy wooden flooring. I look forward to the final pics with all the furniture laid out. I'm a sucker for interiors! OMG so fab!! THE FLOORS!!! Heartiest congratulations on a job well done!! Very exciting times, enjoy your new home. Omg those floors are wonderful. You guys did a great job!!!!!! You have created a lovely new home - I love the colour palette you've used,and the beautiful wooden floors. Good luck with the move, and enjoy your new home. Oh, wow! You did an absolutely fabulous job! I'm so happy for you! It looks wonderful. Congrats on passing final inspection. Amy, this is so exciting!! Wow! I am thrilled for you. I absolutely love that wild and crazy carpet. How wonderful it will be for the kids to feel they have their own space. And how much hard work you have done. 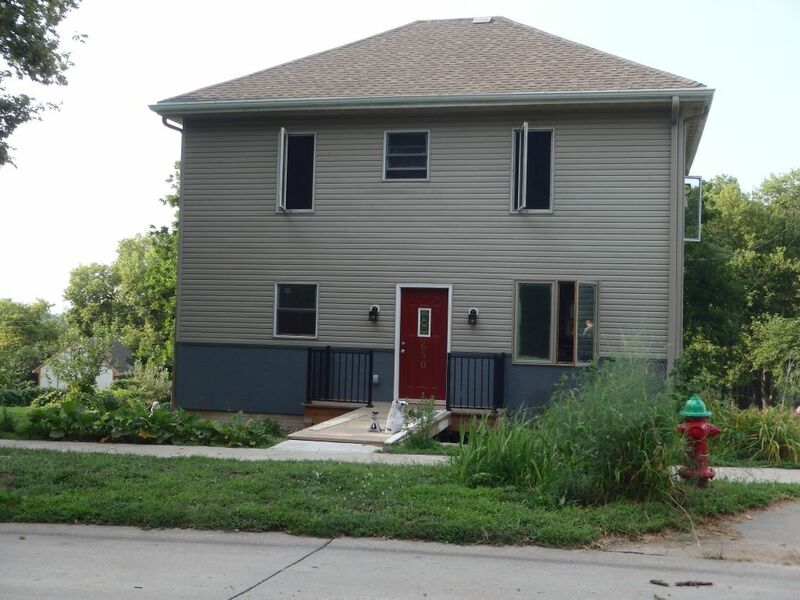 Congrats on passing that inspection and good luck with the move! Those mouldings are gorgeous! Love the paint colours and your floors! How exciting! What a labour of love. I love your color scheme. It's just lovely. Congratulations on your tremendous accomplishment. Your hard work has paid off with a lovely home. I have to ask. What happened with those attic stairs in the far back of the bathroom? Great job here. You must feel proud of this giant achievement and accomplishment because it reflects your personal hard work. Now that it's "inhabitable," when do you move in? Joy - wow! You're observant. The back of the bathroom now has a jacuzzi, and the attic is now accessible by pull-down ladder (from the stair well ceiling) rather than through the bathroom. We don't intend to use the attic very soon - the house without it has 2.5 times the space of our current house, and we think we can get around having to store things in the attic. Kim - Moving date is currently set at August 29th - until then, we're packing, building custom beds for the kids, building a custom wall of cabinets and desks for homeschooling and cleaning up the yard. I'm eager to move though, and regretting (just a bit) setting the moving date so far off, so I suspect that we'll be starting to move smaller things before that. Wow, so much work! Loved reading the story and seeing the "before" pictures. 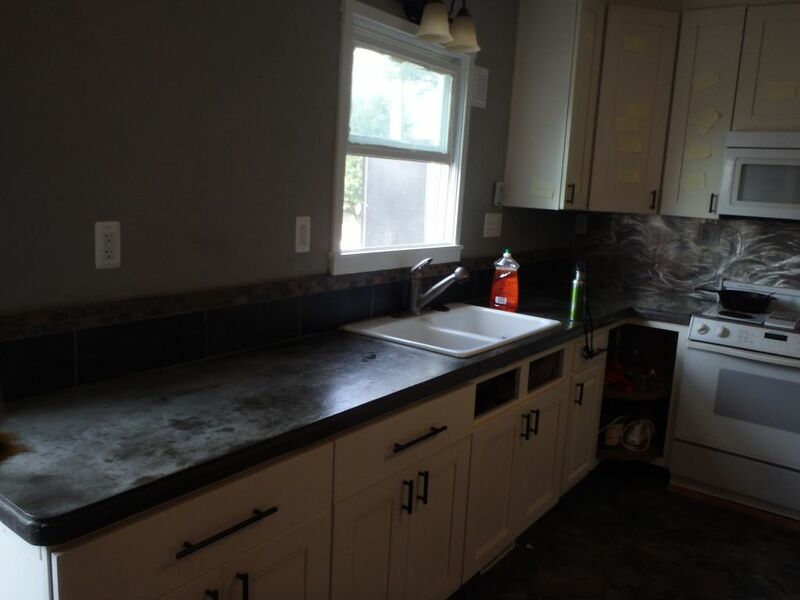 What are you and your family going to do with all your time now that you are no longer doing a major renovation in your "spare" time? Your new home is so gorgeous! You must feel an enormous sense of satisfaction, Amy. I love that blue door. Wow. Lots of work has been done. Great job and I'm sure you put your heart and soul into it. the floors!!!!! and the carpeting --entering the kids zone!! love, love, love!!! Amazing. I admire people who can deal with that, I'd be in the fetal position under the covers crying my eyes out :-) Great job! Omgosh! I am simply amazed. How in the world do you have time for us with all this going on in your life!I love seeing the transformation pics. I am amazed by all the work that must have gone into it. Who knew you could raise a house and pour a foundation. I would have thought you would have to tear it down and start over because of costs. I love the wood floors and all the architectural molding you put in. Enjoy!! Jeanie, from this vantage point, we think it would also have been easier and cheaper to destroy it and start over. But I'm glad we restored it - it's a house with history now, and very well suited to our needs :) We will definitely enjoy it! It's beautiful! I love the colors. Congratulations! Wow! It looks great. Congratulations on a job well done. That's a beautiful beautiful house...Congratulations!!!! You've done such a great job with it and i hope you & the family have fabulous times ahead! WOW! What a difference. I love the fun new carpet.